"UND vs University of Alberta"
Photograph of a UND vs. University of Alberta Hockey game. UND Player Dave Mazur is photographed here. 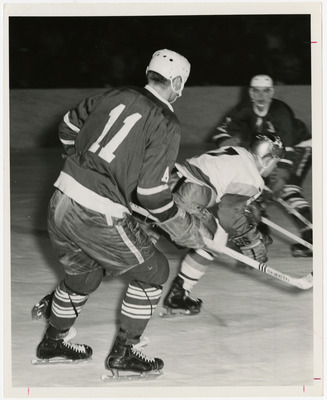 Mazur, a native of Dauphin, Manitoba, played at UND from 1963 until 1965. This photograph can also be found in the 1965 Dacotah Annual, page 82.